When it comes to chandeliers for illuminating a haunted home, forget about the boring ones crafted from crystals, antlers, wagon wheels, or empty bottles, because the skeletal remains of a human body seems much more interesting and appropriate, like this cool new Three Skeleton Chandelier. This horrifying chandelier is crafted from the torsos and skulls of three skeletons (unfortunately, not real), each holding a pair of candles in their hands along with a single candle planted on top of their skulls. 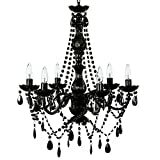 It features chains on top for hanging, plugs into any standard outlet, and includes nine 3-watt flicker bulbs. Check out the video to see it in action. Spooky huh? Perfect for any Halloween, horror, or gothic event.